Surfacing is a group exhibition which allows for an exploration of the transient space between destruction and (re)construction. The exhibition aims to bring to light the fragments and residues that remain after destruction, and linger beneath a new form. In the preface to the 1961 edition of Frantz Fanon’s The Wretched of the Earth, Jean-Paul Sartre writes “violence is man re-creating himself.” Although Sartre speaks of violence as a necessity for overthrowing colonial power, “no gentleness can efface the marks of violence; only violence itself can destroy them.” This exhibition understands Sartre’s notion to address culpability, selfhood and violence and trauma involved in the process of becoming, scrutinizing and (re)creating. 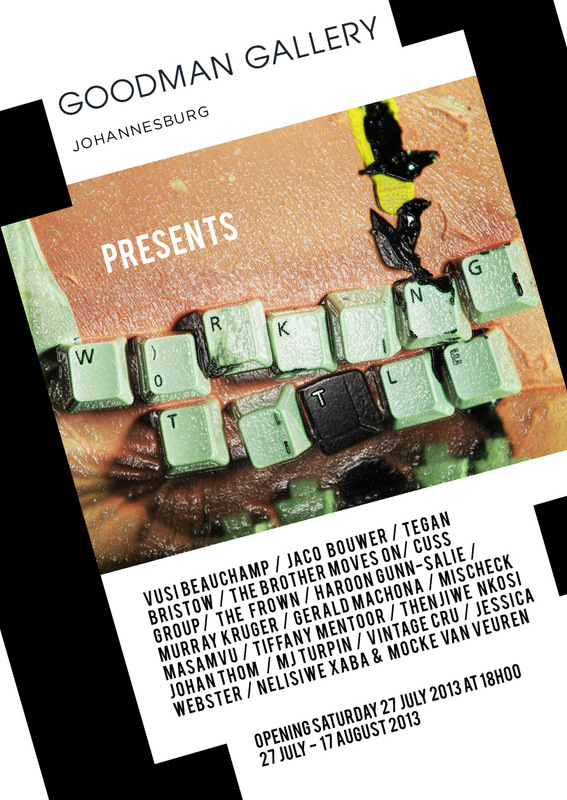 In July this year Goodman Gallery Johannesburg will present the group exhibition [Working Title] 2013. This is the second installment of the annual group exhibition of the same name, the first of which premiered at Goodman Gallery Cape Town in 2012 and was curated by Federico Freschi. The [Working Title] exhibitions are part of a new initiative by the Goodman Gallery aimed at supporting young artists, independent projects and major installations and performances. In the past Goodman Gallery has collaborated with independent curators such as Simon Njami and Bettina Malcomess, who curated the US exhibition, part of which was shown at Goodman Gallery Projects at Arts on Main in 2009. In 2010 independent curator and academic Nontobeko Ntombela curated the exhibition Layers at Goodman Gallery Projects as part of her ongoing research into the creative strategies of women artists, in particular those that aim to contextualise socio-political issues. In 2011 Goodman Gallery curators Tony East and Claire van Blerck produced The Night Show, a 3-part exhibition staged at Goodman Gallery Cape Town, which sought to destabilise the notion of the white cube and to engage with contemporary art practice on its own terms, courting the spontaneous and embracing the ephemeral. Previous projects also include the site specific street performance Cut / Cute by Joel Andrianomearisoa, which premiered in Johannesburg as part of SA Fashion Week, and Nelisiwe Xaba and Mocke van Veuren’s performance Uncles and Angels, which was presented at Goodman Gallery Projects as part of the Dance Umbrella. Goodman Gallery continues to collaborate with academics and theorists, and has hosted lectures by Jane Taylor, Federico Freschi and Alfredo Jaar – whose lecture coincided with his 2012 exhibition at the Goodman Gallery Gold in the Morning – and panel discussions with David Goldblatt, Ivan Vladislavić and Marlene van Niekerk. While Goodman Gallery Projects closed at Arts on Main in 2012, the [Working Title] exhibition series exists as a resolution to the Goodman Gallery’s continued interest in independent and collaborative projects and allows for the continuation of previous projects and relationships, as well as the introduction of new artists, theorists and creatives into the Goodman Gallery. Each year the [Working Title] exhibition will have a new curator, either from the Goodman Gallery or through collaboration with an invited external curator. This year’s [Working Title] is curated by Emma Laurence and includes artists who are pushing the limits of the contemporary South African art scene and who have produced work that is at the cutting edge of current art production. The exhibition is concerned with works that are born out of dynamic and independent practice. Included in the exhibition are artists who work across disciplines and who bring into the perceived elite gallery space sub-cultural aesthetics and standpoints. The show incorporates artists working in various and perhaps unconventional media such as interactive gaming, short stories and punk inspired performance, as well as artists who begin to interrogate modes of representation and viewing in painting and photography. During the run of the show, a series of scheduled events will take place as part of [Working Title] and will include an off-site project by Cuss Group called Video Party, a performance after the opening by The Frown and The Brother Moves On and an opening address and lecture by distinguished theorist Achille Mbembe, who will speak on “The Postcolony Revisited”. Professor Mbembe’s lecture is co-sponsored by WISER (Wits Institute for Economic Research). Wed 24 July 2013, Die Beeld (see: http://www.beeld.com/vermaak/2013-07-24-dissiplines-se-grense-vervaag) also posted in ‘Press | Disspilines se grense vervaag’.